>>Exchange of notes related for "The Road Sector Support Project II"
On 8th April, 2013, the Government of Japan and the Government of the United Republic of Tanzania signed the Exchange of Notes for a Japanese Loan Project to the value of 7 billion 659 million Japanese Yen. The Road Sector Support Project II is worth approximately 131 billion Tanzanian Shillings, and will be provided through co-financing with the African Development Bank under the Enhanced Private Sector Assistance Initiative (EPSA) for Africa. The project will cover two road sections, firstly the 188 km section of Dodoma - Babati Road, including the portion from Mayamaya to Bonga. This road is part of Trans African Highway which is an international corridor connecting Cape Town and Cairo. Secondly, the project includes a 203 km section of Mtambaswala - Mangaka - Tunduru in the Mtwara Corridor. This section will link the Southern Regions of Tanzania with Mozambique, Malawi and Zambia. Ugrading of these roads to bitumen standard will promote trade with African countries, and will most certainly have a positive effect Tanznaia on Tanzania's economic development and poverty reduction. The above loan will be extended and financed through the Japan International Cooperation Agency (JICA) under the Loan Agreement signed between JICA and the Government of the United Republic of Tanzania. H.E.Masaki Okada, Ambassador of Japan, and Hon. Dr. William A. Mgimwa, Minister of Finance, signed the Exchange of Notes, and Mr. Yasunori Onishi, Chief Representative of JICA Tanzania Office, and Hon. 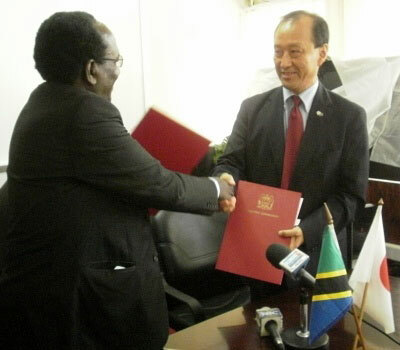 Dr. William A. Mgimwa, Minister of Finance, signed the Loan Agreement.